Virtual reality isn’t a topic that I know a lot about. I’m not a gamer in the slightest. I know that it’s being used for a whole bunch of great things, like enhancing cancer research, but that is where my VR knowledge draws to a close. So, it seems only fitting that I would be tasked with writing a review on VR from the perspective of someone that knows nothing about it. Virtual reality technology falls on a scale. At the high end are headsets like Oculus Rift and the Vive, and at the low end falls cardboard headsets like Google Cardboard. “The scale, and how it ranges, is you have cardboard which is your static virtual reality where you can stay in one place and spin around – you can see in 3D and 360 [degrees]. To the Vive which is interactive in the sense that you can walk around a pick things up. More importantly, it is room-scale virtual reality and that means you can walk around the room and can interact with objects as if they are real,” Brennan, Senior Facilitator at Devika Learning, explains. I got to experience the two ends of the virtual reality world, testing to see how much of an entertainment factor it could have for gaming and binge watching your favourite TV shows. The Vive is run through Steam and Valve, who make the headset in collaboration with HTC. 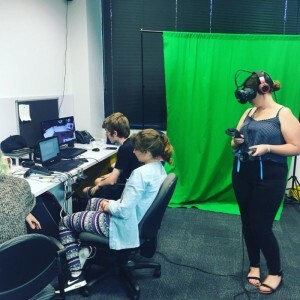 I didn’t know what to expect in the slightest when the Vive headset and headphones were placed over my head and the controllers placed in my hand. I was tasked with playing a game called Accounting where I would dive deeper and deeper into the virtual reality world, only having to kill myself repeatedly to escape. Me attempting not to cry using the HTC Vive. I was then given the Google Daydream. It’s on the lower half of the scale of virtual reality devices, but it’s the best of the lower end. However, unlike Vive Google Daydream is far better designed for binge watching TV. You get to sit in one spot with a 360 degree video experience. I watched an interactive movie created by the BBC titled The Turning Forest, and it was kind of awesome. One thing you have to be cautious of is that this VR runs off of your phone, which means wifi and bluetooth connectivity may be an issue. You need to make sure you have an excellent connection because lagging just kills everybody’s fun and no one wants that. There were some issues though – after using the VR technology for about an hour, I had a world class headache, the kind I get after staring at a screen for too long in close range without my glasses on. Whilst they are brilliant technologies, I probably wouldn’t recommend using them for too long – A.K.A don’t watch all of Outlander in one day. The technology doesn’t come cheap either -the Vive headset costs about $1300, but you also need a $2000 computer to run it. The Google Daydream is cheaper, costing about $120, but again, you need a $1200 phone to ensure the technology runs smoothly. Thank goodness for cardboard VR, am I right? Whilst VR can be used for changing the world, it can also be used for entertainment purposes, and, if you can, you should definitely test it out!